…until I saw the trailer. 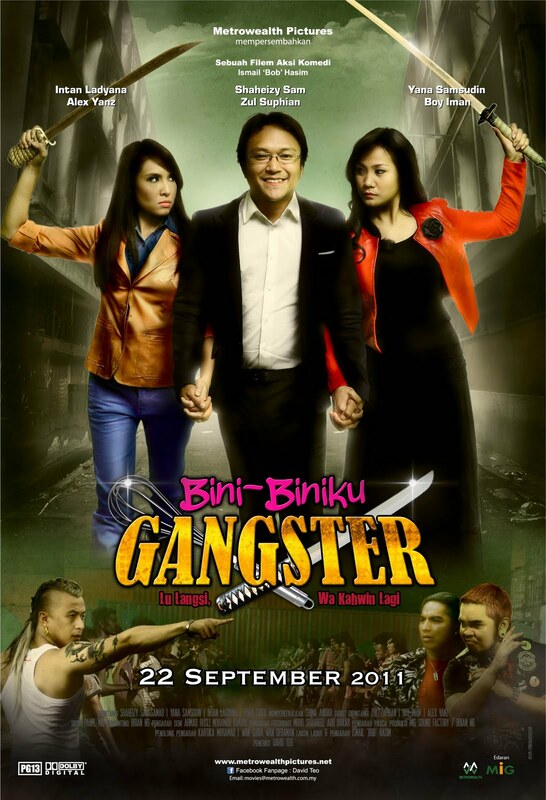 The story basically follows a man who married two rival gangsters without knowing that they are actually gangsters. The scene, then, begins with him sauntering into his bedroom, reading the label at the back of a bottle of lotion, without realising that his wives are fighting each other almost to the death. Keen to keep the facade going, the two women immediately settled into their respective positions, all the while in their PJs. “Hai sayang,” they greeted him playfully. He involuntarily squeezed the bottle, provoking a number of ‘coming too early’ jokes to hearty laughters. One of those laughters belonged to me, and on the strength of that scene alone, I made an effort to watch the film. The film follow the lives of Herry (Shaheizy Sam) and Manja (Yana Samsudin, also doubling as one of the co-writers; more on this later). They live what appears to be a pluperfect married life, with the husband appearing to make lots of money while the wife is able to sit at home and play princess, basically. Of course, moving beyond this realm, things are not quite as they seem. Manja is the leader of a gangster group, and a very capable one at that. At Herry’s office, however, he is constantly put down by his colleague, Mat Saja (Zalif Sidek in the almost pre-requisite role of ‘the fat guy we can laugh at in Malay movies’). Work piles up, and inevitably, we have the third element in this triangle. Enter Reanna (Intan Ladyana), stage left, as Herry’s secretary, and now we have ourselves a story. Manja could not conceive, and thinks that it is a part of her duty to find her husband another wife so that he could do the business and have a child. This is the part that got a bit tricky; upon finding out about Reanna, she met her and asked whether Reanna would be interested in marrying her husband. Reanna agrees, but then the truth came out: she is a part of a rival gang, who is intent on going after Manja’s gang. Whatever will happen next? Well, to know what happens next you’ll have to watch the film, but this film is quite interesting to look at on a number of levels. From the storyline itself, it is clear that it is a story that sets itself apart from many other films. As such, we can almost immediately banish any sort of consious links one is tempted to make to ‘My Wife is a Gangster’, although of course such formulaic forms of expression would inevitably see common elements in place. However, the fact that the story itself plays around the idea of polygamy suggests a kind of fantasy in place for both the male and the women. The idea of having more than one woman is something many males would find pleasing for a number of different reasons. Lest I be accused of advocating for such arrangements, I am merely pointing out a Malaysian cinematic tradition of: a) playing to the fantasies of its audience, and b) going beyond the context of Malaysia, playing to the fantasies of the male, in particular. What 'Joy Luck Club' could have been. In truth, it is not a particularly new construction, having been played around with since the P. Ramlee days all the way to…err, Razak Mohaideen. It does, however, add new elements into the mix, and this is where the fantasy of the female comes into power. On paper, it appears that the guy is the one who is on top. In reality, however, the machinations of the film sees women being in the ascendancy. For example, Manja and Reanna conspired amongst themselves to marry Herry with Reanna. This might sound improbable, but it is an experience that the lead actress, Yana Samsudin, went through. Another woman, who could not conceive a child, approached her to see whether she would be able to get married to her husband and conceive a child with him. Though she turned it down, that experience lends itself to the making of this film. It doesn’t help that whatever control and authority Herry has, he is undermined every other step of the way. He appears to be subservient to his wives wishes even without knowing; realising that they are fighting each other, he first assumes them to be fighting because of the new relations created as a result of their respective marriages. He also believes to have gotten it under control, being the authoritative figure who lectured them on the importance of being a strong family together, even as they are fighting (and impressively so, I have to admit) every single time he turns his back. This illusion of power through lecture is only and exactly that…an illusion, for power in this case is given rather than taken. Take note, politicians. I didn’t start it, though, the film did. There was even a line in the film about the importance of 1 keluarga, and you can read whatever you want into that. Furthermore, Herry is also emasculated within his working environment. His duties pile up largely because he is unable to deal effectively with the antics of Mat Saja. While that is nothing more than a plot device to bring Reanna into play, the lasting impression (at least for me) is of someone who is not inadequate at his job, but a little more mojo, initiative, and, dare I say it, performed masculinity and machoisme wouldn’t go amiss. Alas, this apparently-weak character gets his day in the sun, but the sun could and probably should have shined a lot brighter and a lot earlier. The fact that Yana's in all the photos included here so far are purely accidental. Such moves are not accidental, even if they were presented as comical happenstances. Speaking of comical happenstances, I am not a big fan of the fat man being laughed at, but as I have slyly noted before, these kinds of characters appear to be a comical requirement for such films. How right is that? I don’t know, but though I laughed at him for falling flat on his face (sometimes literally), much of that is derived from the fact that he is a bit of a jerk, and deserves the comeuppance that usually comes the way of these characters as well. This film, then, is a pretty funny film in its own right, and one that deserves to be seen as a comedy that is worth watching (especially if you’re a fan of Ismail ‘Bob’ Hashim, the film’s director, whose films tend to be more enjoyable more often than not), rather than be necessarily and exclusively analysed in the manner I just did. That is, though, the thoughts that came to mind. There’s more to this film, but I believe the above did more than reflect on the gist of the film presented. I think the performers themselves performed fairly credibly in the portrayal of their characters, and the film was short and sweet enough that it didn’t feel at all draggy. Some of the scenarios presented could have been thought out better (if you know you’re going to miss your dinner because of work, call her earlier, and don’t make her wait until the candles are out and dinner is served, bongok!). The conclusions I presented are not conclusive by themselves, because the film’s end will raise further questions, but those are the questions worth answering by yourself.